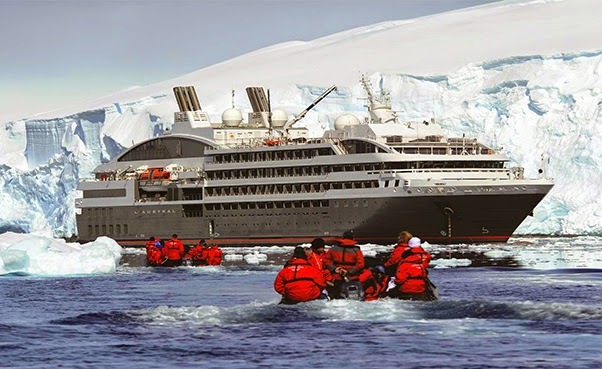 The world’s only French-flagged cruise line and top cruise line worldwide in polar expeditions for 15 years, COMPAGNIE DU PONANT’s itineraries to the Antarctic for the 2015-2016 season are now open for bookings. Including Open Bar, these cruises benefit from the PONANT BONUS (up to 30% savings on brochure prices) for a limited period, and may be extended with a host of pre and post cruise programmes. From November 2015 to January 2016, COMPAGNIE DU PONANT has three outstanding itineraries offering a genuine polar safari experience to observe the region’s unique wildlife in its natural habitat. Aboard LE BORÉAL, L’AUSTRAL and LE LYRIAL, luxury French-flag yachts of 122 to 132 staterooms and suites, designed for polar cruises and complying with the international “Green Ship” label, passengers gain access to protected sites only accessible to small capacity ships, limited in this region to 200 passengers. Flexibility at all times is the approach that sets these cruises apart, with Zodiac® outings to get passengers as close as it is possible to be to nature, with time to linger over the region’s most emblematic sites. At any moment the ship may alter its course to admire the acrobatics of a humpback whale or land passengers on a beach to meet a particularly impressive penguin colony. It is a unique experience made all the more interesting by renowned South Pole specialists who are only too delighted to share their views and passion for these polar lands which they have been roaming for years. Currently available: Ponant Bonus 30% for lead in Deluxe Stateroom is $9080.00 AUD (based on Le Lyrial 29th November 2015). Direct return flights and transfers from Buenos Aires to Ushuaia included. Currently available: Ponant Bonus 30% Superior Stateroom $11,270.00 AUD (based on L’Austral 15th December 2015). The website www.ponant.com provides details on the fleet, voyages, itineraries, inclusions – and the videos in particular will give an appreciation of the French style that is the PONANT signature. Further details available by calling 1300 737 178 or +61 2 8459 5000, or see your travel agent.